When researching ideas for UK rail holidays we inevitably seek out the interesting, scenic and heritage railways to visit; but it's not always about the trains and steam as we look at ways of enhancing our UK tours through the places we visit and what we learn along the way. In May 2015 we have two escorted tours that take us on revealing journeys that uncover the UK's naval and transport heritage and offer a glimpse of a bygone age still evident on two little islands around the British Isles - The Isle of Wight and Isle of Man. Our 10-day tour of the Isle of Wight & Southern England combines journeys and steam railways with an in-depth look at Britain's wonderful naval heritage. Our first stop on this tour, which departs on 20th May, is Portsmouth - home to the country's Royal Navy, past and present. 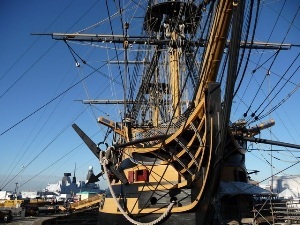 Our visit to Portsmouth Historic Dockyard includes a private tour of HMS Warrior and Victory and we soak up the history at the award winning Mary Rose Museum and the Museum of Royal Navy. A taste of what you can expect at the historic dockyard can be found in this 'Tips for Travellers' article. A visit to the Isle of Wight is like travelling back in time to an old-fashioned English way of life with its picture postcard villages, traditional steam railway and genteel landscape. Enjoy the views of the unspoilt countryside from a private carriage on the Isle of Wight Steam Railway - click here for a personal memory of the railway. The island boasts strong royal connections as Queen Victoria's favourite holiday home was Osborne House, a popular tourist attraction. Our tour includes a visit to this impressive royal seaside retreat, as well as the Needles, both of which are mentioned in a comprehensive article on the Isle of Wight by Discover Britain. The tour, priced from £1,450pp, continues the steam and naval theme when we visit Exbury Gardens to meet the Head Gardener for a tour and learn about Britain's shipbuilding history at Buckler's Hard. 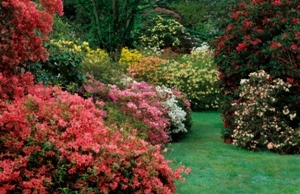 There will be something for both garden and train lovers at Exbury Gardens as its little steam railway is a great way to see the blooms, especially the Azaleas and Rhododendrons in May. For information about Buckler's Hard we thought we would share this personal blog by a New Forest resident. The final leg of the journey delivers more vintage nostalgia with a ride on the Mid-Hants Railway or the Watercress Line whose history is fondly documented by h2g2 and we follow this with a fun visit to Britain's famous steam powered funfair museum at HollyCombe. LAST CHANCE also to book onto Ffestiniog Travel's 8-day tour of the Isle of Man - a real treat for rail and transport enthusiasts but this island also holds a unique charm that cannot fail to appeal to all visitors. Guardian writer Dixe Wills describes it as the "land of old-fashioned eccentric charm and mystical mistiness." The tour which departs 13th May, and is priced from £1,025pp, includes organised journeys on the island's many railways, a vintage bus trip and a '14 Railways' Cruise. Unlimited travel on the island's scheduled rail and bus services means you can also enjoy some independent sightseeing. 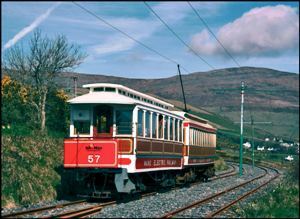 This tour is described as the 'Isle of Man Driving Experience' as everyone will have the opportunity to spend a day driving a chartered tram on the Manx Electric Railway, subject to certain restrictions. Click here for an in-depth background piece on the island's Marine Drive and Manx Railway to arouse your interest. We hope you find the additional reading material recommended above of interest and it helps give you an idea of what you can expect from these two comprehensive escorted tours. If you would like to discuss either rail holiday in more detail please contact us direct by calling 01766 772030 or email info@ffestiniogtravel.co.uk. If these tours appeal to you, but the timing of the holidays are not convenient, please contact us to discuss tailor made opportunities. Whether you are an individual, a couple or a group we will help you to create your own bespoke tour to the islands.